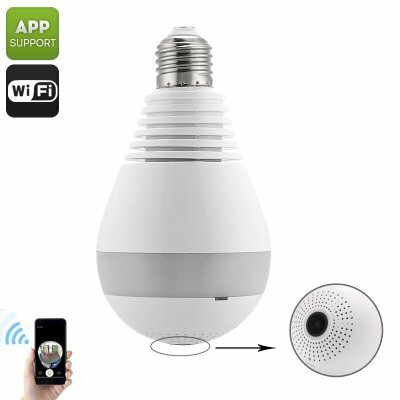 Successfully Added 360-Degree IP Camera Light Bulb - HD Video, Motion Detection, App Support, Night Vision, SD Card Recording, IR Cut, E27 Fitting to your Shopping Cart. Intergraded within this LED light bulb, you’ll find a high-end 360-degree IP camera. This security gadget is able to light up your room while simultaneously keeping an eye on all what’s happening in its surroundings. With a 360-degree fisheye view, not a single corner in your home or office will stay out of reach for this IP camera. Thanks to its night vision capabilities, this IP camera keeps your property fully protected at both day and night. IR cut ensures that your security camera automatically switches to night mode whenever natural light is turning low. By supporting motion detection, this IP camera will capture all movement in your room on tape. Whenever movement is detected, this LED light bulb security camera will start filming automatically and store the recordings onto the inserted 64GB SD card. Additionally, it is able to share a snapshot via the dedicated mobile Application in order to update you on the potential security breach. Like this, you’ll always be up to date on the latest security status of your property, even when you’re not personally around. As a wireless camera, this gizmo can be easily installed. Simply screw it into your E27 fitting just as if it were a regular light bulb. Once in place, it lets you light up your room and keeps track of everybody that enters your property when you’re not at home. With its 1MP 1/3-Inch CMOS sensor, this security camera produces crisp HD footage. The mobile application supports both iOs and Android smartphones and allows up to 10 users to access the IP camera from afar. With its unique design and 360-degree angle, this is the perfect security camera for your home or business.